First day (Friday March 8, 2019) the fleet left shore in the morning in a brisk breeze. 20x 3.7 Class, 20x J14 and 20x Finn. The forecasts from guru, predict and others was for relatively light to moderate winds throughout. Metservice had some higher wind warnings. Metvuw had a thunderstorm cell directly over the course at lunch time. The Metvuw storm cell did hit as predicted and in the end all boats were called back to shore and some of the J14 were missing in action for an unsettling long period that nearly provoked channel 16 calls. Silvana was back onshore and assisting returning boats. She cut her leg open on oysters at edge of the inner boat ramp (event over for her & 7 stitches). The 3 fleets remained ashore for some time then went back out again to start racing. In the end no races were held and there wasn't steady breeze until after 4pm. So, there were 20 joint overnight leaders. Second day (Saturday March 9, 2019) racing was held with three races. This had some difficult racing, poor visibility at times, a left over seaway, winds generally light, almost a lay through to the first mark and Mark OBrien breaking a trapeze line while vying for the lead he dropped to 5th. In the third race the storm cell came back! But this time from the opposite direction. The finish boat dragged anchor turning the finish line inside out and there was a fair amount of excitement (again). Everyone back to shore with a bit of a traffic jam on the ramp. Final day (Sunday March 10, 2019) four more races were completed in light to moderate winds. Results were very tight between Derek Snow, Daniel Wilcox, Mark OBrien 3rd and Paul Snow-Hansen. Daniel 2nd had ripped up his sail a bit coming shore in one of the storms, Paul had his rudder fail in race 5. As time ticked on, Geoff Woolley had to leave and gave his boat to Paul to continue on with in races 6 and 7. So the 5th and 4th were Paul's. Paul already had two firsts and a 5th. So, without a degree of bad luck either Paul or Mark could have been closer overall. 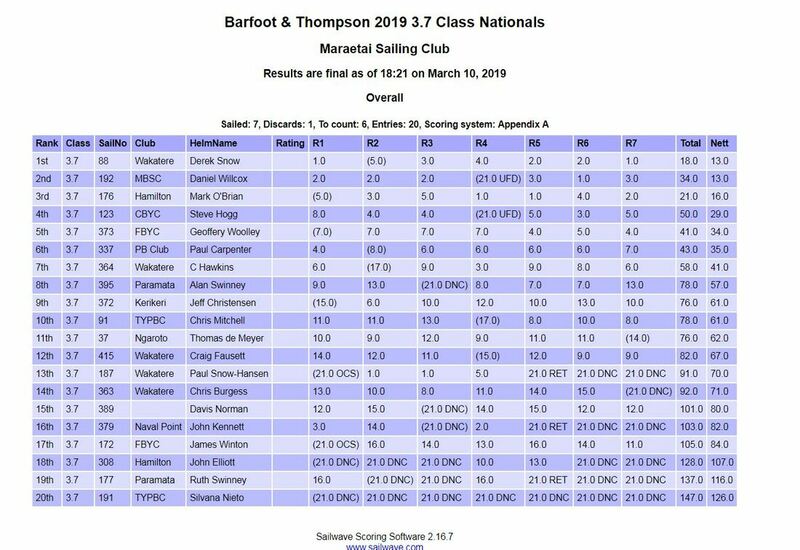 With four boats so close in the top four and star studded sailors such as Paul, Geoff and Daniel, it was I think one of our best contests of recent times and also a bit of validation that our top sailors are competitive too; making for some great racing. The actual weather and courses did undermine this a little but that's yacht racing. A closely fought and well deserved win to Derek Snow (father of Paul). Derek also won the Veteran's Trophy and the Grand Veteran Medal 55+. Stephen Hogg 4th won the 45+ veteran medal, Paul Carpenter 6th won the +65 Great Grand Veteran medal. Jeff Christensen 9th won the Handicap Trophy, Alan Swinney 8th won the Silver Fleet, Kennett Cup. Ruth Swinney won the 1st Lady Trophy donated by Silvana Nieto. It was great to have a fleet of 20 boats thanks to everyone who sailed or lent their boat so someone else could attend, without you it would have been a bit sorry.